The Conservative Party of Canada took a big hit as the federal election reached an unofficial milestone today, dropping two candidates from their slate. 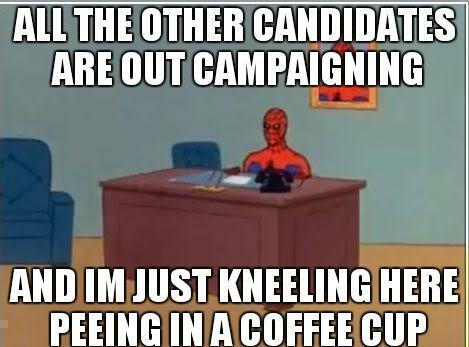 Jerry Bance, a Conservative candidate in Scarborough Rouge Park, was the first to go after reportedly being caught on video urinating into a coffee cup while he was working as appliance repairman. The day got worse as Tim Dutaud, running in Toronto-Danforth, was declared persona non grata by the federal party. In non-diplomatic usage, referring to someone as persona non grata is to say that he or she is ostracized. Such a person is for all intents and purposes culturally shunned, so as to be figuratively nonexistent. A Conservative official confirmed a man seen making prank calls in several YouTube videos — including one where he pretends to have a mental disability — was in factDutaud. Bance, who is an owner of an appliance repair company, was bounced from the Conservative slate after the CBC reported its hidden cameras on the show Marketplace caught him urinating into a cup while he was on a service call in 2012. Video from the program shows Bance pouring the urine down the sink, then rinsing out the cup, all while the homeowner was in the next room. A statement from Bance released by the Conservative campaign Sunday night said he “deeply regrets” his actions on the day he was caught on the hidden cameras. Check out the video for yourself. You’ll see for yourself what Bance did. Will you vote for the Conservatives now that you know what kind of candidates they have running? Social Media platforms have been strewn with a steady stream of urine-inspired jokes. #peegate has been trending on Twitter in Canada since the story broke out this morning.